Book of Revenge showed up in my mailbox before I got a chance to read the first book in the series, so I can't tell you for sure if it takes up right where Book of Love left off. Here's what I can tell you: Max, Jane, Emily, and Wes are all still reeling from the events of the first book. Max and Jane are together now, as are Emily and Wes, though Emily suspects from Wes's thoughts that he's not entirely over Jane - or, if he is, he's not happy that she's happy. Jane is beginning to get frustrated with Max's inability to answer even the simplest question, and she's not sure what she's going to do if she doesn't get some answers. Unbeknownst to them all, Max's former fiance, Avery, is plotting with his brother, Greg, to find a way to make Max miserable. Simply killing Max would be too easy - she wants him to suffer. 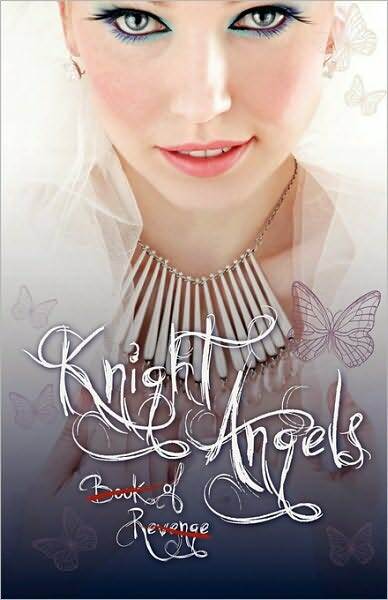 When she discovers that Max has found his foretold human girl, she knows she has the perfect plan . . . 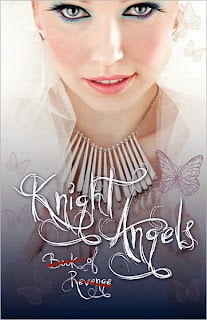 I've been looking forward to reading the Knight Angels series for a while, so it's a shame that I didn't enjoy it. This was a difficult book to read. Switching regularly between six different points of view and with no chapter divisions, Book of Revenge felt choppy and disjointed. Another big issue with the book is the complete lack of proper editing. "You're" is consistently used in place of "your," sentences were missing verbs, and the spelling was less than ideal. If you're going to publish a book, you really need to have a qualified editor look it over. I discovered after finishing that Abra Ebner publishes her books through a very small publishing house founded by a group of authors. While Book of Revenge had great potential, I feel that it would have been a much better book had the author taken it to a more well-known publishing house and let their editors take a crack at it. This is not to say that the book didn't have its good points, however. My favorite part was probably Stella, an owl with a crush on Wes. I just feel that this book could have been so much better had it gone through the traditional book publishing process. Abra Ebner is the author of the Feather series and Parallel.